… and, I had a blast. Sam proved to be an excellent and knowledgeable instructor with a clever and fascinating ideas. 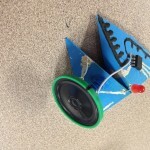 In the morning, he walked us through making speakers from bits of wire, paper, glue, and magnets – a great project for building hands-on skills and showing how it’s possible to build your own technology with a tiny bit of knowledge. Most of us just buy completed speakers or headphone and treat them as black-boxes, never to be disassembled or questioned. Sam showed us that speakers are simple technology well within the grasp of anybody. 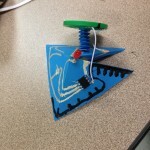 In the afternoon, we built the “electric synth.” The exercise was less about the music than about creative use of conductive inks to draw circuits and embed microcontrollers. I “colored outside the lines” and made my synth into a pyramid with the speaker on a paper spring. This construction technique, while imperfect since the inks tend to be difficult to place precisely and can be brittle, is powerfully simple. Anybody who can draw a line can build a circuit and harness technology in interesting, interactive, artistic ways. 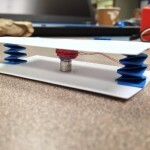 Thanks to Sam Jacoby and the SparkFun staff for a good day.